The S.S. Dorchester was one of three identical ships built in 1926 for the Merchants and Miners Transportation Company. She was the largest ship launched on Saturday, 20 March, by the Newport News Shipbuilding and Dry Dock Company, in what was called "The most unique multiple-launching in the noteworthy history of American shipbuilding." On that day the company closed production, invited the public in, and between 12:30 A.M. and 2:45 P.M., launched nine ships and laid the keels of three others. Dorchester, hull #289, launched at 2:15 P.M. She was named after an earlier ship owned by the Merchants and Miners Transportation Company. "The cabin accommodations are designed for the luxurious comfort of the Florida traveling public. In keeping with the modern trend of shipbuilding, the accommodations are complete in every detail, as found in the finest hotel." Dorchester carried up to 314 passengers up and down the eastern seaboard. Many of her passengers vacationing in Florida were able to take their automobiles with them for an additional charge. Dorchester featured oscillating electric fans and telephones in all rooms, and an onboard freezer so that the passengers could enjoy ice cream, even while at sea on the hottest days. Tourists were carried between Miami, Jacksonville, Savannah, Norfolk, Baltimore, Philadelphia and Boston. The ship had a dance pavilion on the boat deck and provided music from 10:30 to 12:00 A.M. and again from 9:00 to 11:00 P.M. During the day live music recitals were conducted in the music room and when conditions permitted, radio broadcasts were played. A hostess served tea each day in the social hall from 4:30 to 5:00. Deck games were provided, as well as card games and a circulating library. Religious services were held each Sunday in the music room at 11:00 A.M. Passengers were able to send wireless messages, and the ship had a barber shop. Three meals were provided as well as "night lunch" between 9:00 and 11:00 each evening. In February 1942, the S.S. Dorchester entered the war effort as the United States Army Transport (U.S.A.T.) Dorchester after being converted to a troopship in New York by the Atlantic, Gulf and West Indies (AGWI) SS Co. She was given additional lifeboats and life rafts, as well as four 20mm guns, a 3 inch 50 caliber gun fore, and a 4 inch 50 caliber gun aft. Her large windows in the pilot house were reduced to just slits. The ship that once carried 314 passengers and 90 crew would now more than double her capacity and carry 906 crew and passengers. Of the crew many of the civilian officers remained with the Dorchester, including her master. The Navy provided "Armed Guards" to man the guns and messaging lights. The Dorchester's master, Capt. L B Kendrick, continued on during the first five voyages to Greenland in 1942. After the fifth voyage he retired and master Danielson came aboard for his first and last voyage. Captain Krecker was the commanding officer while Lt. Arpaia was the commander of the Naval Armed Guard. Also aboard were four Army Chaplains, Father John Washington (Catholic), Reverend Clark Poling (Dutch Reformed), Rabbi Alexander Goode (Jewish) and Rev. George Fox (Methodist). There were also two Merchant Marine Academy cadets on board: C/M Edward J. Gavin and C/M Samuel T. Tyler. 3 Feb. 1943, about 100 miles from Narsarssuak Greenland (code name Bluie West One) on a cold, moonless, starless night... At 00:55 a torpedo hit Dorchester's starboard side, just forward of her beam. The power and lights went out immediately. The Dorchester, listing to starboard, was able to get out six blasts on the fog horn, and had started another six blasts, when the steam ran out. Many of the troops, ordered to sleep with their lifebelts on, didn't do so because of the heat trapped within the ship's hull from her boilers. They came up to the deck to find stark contrast. According to survivor accounts, commanding officer Captain Preston S. Krecker assisted his men in abandoning ship, and went down with the ship doing so. The four chaplains found a deck box full of lifebelts and together started assisting the men who were without into the belts and overboard. Soon the box was empty. The chaplains, one by one removed their own lifebelts and gave them to men who had none. The Chaplains locked arms, sang and prayed for the men as the Dorchester sank with them on board. 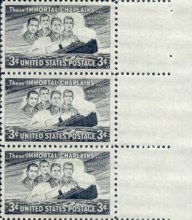 In 1948 the US Postal Service honored the chaplains with the "These Immortal Chaplains" stamp. Television and movie producer, Ken Wales learned of the story of the Four Chaplains from his father, Dr. Wales E. Smith, who attended Yale Divinity School with one of the men, Clark Poling. Ken is determined to keep the legend of the Immortal Four Chaplains alive, and his book, "Sea of Glory" published by Broadman and Holman, is currently being turned into a major motion picture. Stanley Brewer generously donated the items appearing on this page to the GreatShips collection. Mr. Brewer is the Great Nephew of Nace Darnell, one of the few survivors of the sinking of the USAT Dorchester. He has reaearched the Dorchester extensively, and is a contributor to the Ken Wales book "Sea of Glory."